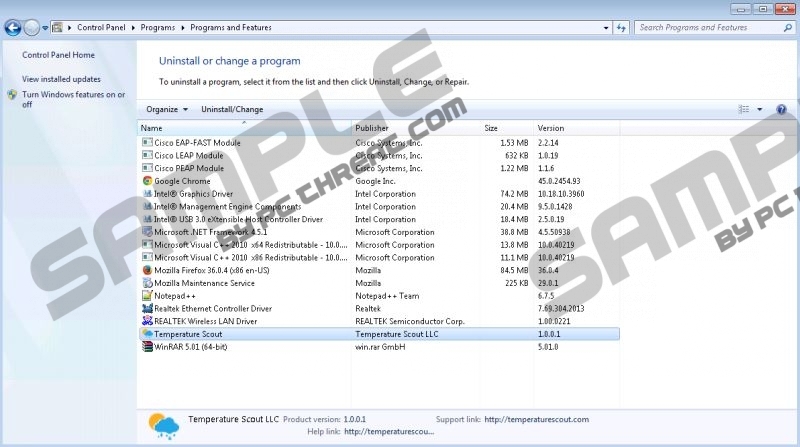 Temperature Scout is a useless adware application that pretends to be a legitimate weather detector. However, many of the promised features of this program are even inaccessible. Besides, the application gathers data, even the personally identifiable information, about its users. The program makes your Web browsing annoying with commercial advertisements. In addition, you can always be redirected to a website that belongs to some sponsor of this adware program. No one could guarantee that those websites would not be filled with inappropriate content, so better remove Temperature Scout from your device in order to eliminate any possible unwanted consequences of its usage. This application is not unique regarding what promises it makes. It is almost identical to the StormWatch adware application. But the latter program is able to work well and really alerts you about the coming storms if it is downloaded from its official website. Only other versions that sneak onto your system in bundles with other programs are of limited functionality. Situation is a bit different in the case of Temperature Scout. Even if you download the application from its official source, the weather detector is not properly working. It shows you the incorrect temperature, suddenly changes your supposed location, and the promised more detailed information about upcoming temperatures is not accessible. Only the bundled version of StormWatch irritates you by a never-ending flow of ads, but even the official edition of Temperature Scout may be involved in this disturbing activity. We have mentioned bundles earlier because it is the common way of distribution of similar adware programs. Users would surely decline to install them if they were aware of possible threats those programs can bring. So, to trick people and place adware applications in packages with other free programs is the method used for spreading those applications more widely. Talking about the possible threats that Temperature Scout brings we should say that sometimes you will receive a message telling that a webpage you want to enter cannot be opened. After this, you may be redirected to the third-party website and that redirection will be “based on the content of the website address, or URL, which you entered.” So, we can guess that you may find yourself on the webpage that somehow looks similar to the page you initially wanted to open. If you wanted to access your online bank account, get confused, and entered your credentials on the completely different site, then you really risk of turning very sensitive information into the hands of unknown people. The elimination of Temperature Scout can remove those risks. There is no single reason to keep further the useless application. Its functionality is very questionable, but the negative effects of its usage are clearly visible. So, waste no more time and delete the adware application from your computer. If you decide on the manual elimination of Temperature Scout, then it is easy to do this by means of Control Panel. But you should consider transferring this task to a professional antimalware tool. If you do not possess the skills of a real computer guru, you surely will not be able to completely protect your virtual safety yourself. Only a trustworthy security solution can detect all the latest online threats and ensure that none of them find a way on your computer. Launch Control Panel and go to Add or Remove Programs. Press Win + R to launch Run. Enter Control Panel in a box. Open Uninstall a program and remove the unwanted program. Launch the Start menu and access Control Panel. Go to Uninstall a program and delete Temperature Scout. Quick & tested solution for Temperature Scout removal.